Driven: Hyundais i40 prototypes | What Car? Hyundai's new i40 has already got the thumbs up from What Car? readers in a recent clinic and that's without it turning a wheel. So what's it like on the road, or more specifically, the UK roads we use to tests hundreds of cars every year? What Car? was invited to give feedback on two prototype versions of the i40 Tourer that will go on sale in September. One car was more comfort-orientated, the other was firmer and sportier. As the different approaches to the two cars show, tuning of chassis settings continues until the last possible moment before a car goes on sale. In the case of the i40, that's a good job. Even the car on softer settings was overly firm, jiggling occupants around on the streets near our offices in South West London and not really settling much when on the motorway, either. Its the sort of ride that can get tiresome over longer journeys and never really goes away. What was worse, though, was the steering. The i40 gets an electric power steering system, which, in the comfort car, has been given an artificial weighting that makes it feel heavy around town and just plain lifeless at speed. The more sport-orientated version of the same car suffered from the jitters even more around town and on the motorway, causing us to wince over the worst bumps and being a constant irritation. However, the steering was much better lighter and feeling slightly more responsive, although as with most electric power steering systems, it still doesnt have the feel of a more traditional hydraulic set-up. Thankfully, its not too late for Hyundai to make changes to the car thats the purpose of these early validation drives. We hope to drive the finished car in the summer with the better of the two steering set-ups and a more compliant ride. The good news was the strength of the 1.7-litre turbodiesel engine, which provided plenty of pull, plus the promise of strong (60+mpg) economy and 113g/km CO2 figures to tempt company buyers. Its not the most refined diesel unit, though a little loud when accelerating and a bit rattly at low speeds. A 2.0-litre diesel will also be available along with a 1.6-litre petrol when the car goes on sale. Its a stylish estate with decent space in the front and okay space in the rear. Quality inside is a step up from that seen in recent Hyundai models, too, with plenty of soft-touch plastics and decent seat materials. The dash design is a little fussy, but wed expect high levels of kit on all models. 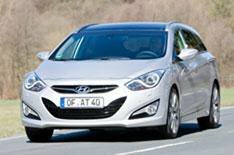 Finished versions of the i40 will go on sale in Tourer form in September priced from around £18,000. A saloon version will follow early next year.